See the CBC video clip of REAP-Canada's innovative research on switchgrass. Unprecedented opportunities for biofuel development are occurring as a result of a number of simultaneous factors including the rising cost of oil, natural gas and electricity; the need for energy resource security; and climate change. Agriculture has a surplus production capacity to be more than a food producer. Because of their efficient ability to collect solar energy, high yielding whole plant perennial bioenergy crops represent a promising opportunity to develop sustainable biofuels and support rural development. Eighteen years ago, REAP chose the path of developing native warm season grasses on marginal farmlands as the best approach to creating sustainable energy sources from farmland that will efficiently reduce greenhouse gases. More than ever, we believe it is the the best long term option in temperate regions to ecologically produce appreciable quantities of energy sustainably from farmland. It is evident global expansion of the use of important food crops like corn and oilseeds as fuel will face a challenging future because of rising concerns with food inflation, food security, and world hunger. Visit REAP-Canada's on-line library with more than 70 publications on biomass energy. How best can we produce renewable energy from farmland? The need to find alternatives to replace increasingly expensive fossil fuels and reduce Greenhouse Gas (GHG) emissions has peaked interest in biofuels around the world. The ability of agricultural plants to capture and store solar energy through photosynthesis holds great promise as a renewable energy solution for mankind. However, at the same time agriculture must maintain its primary energy production role: creating nutritious food for the human body. Sustainable biofuels must be developed that also ensure a continuous supply of fairly-priced food for the people of the world. The first thing that can be done to make biofuels more sustainable is to develop energy crops that more efficiently capture solar energy to increase the overall energy produced per hectare. The best options are energy crops that can do this with less fossil energy use and can be productive on marginal farmland. Currently, cereal grains and oilseeds are being used to produce biofuels but these are not the most efficient option available. 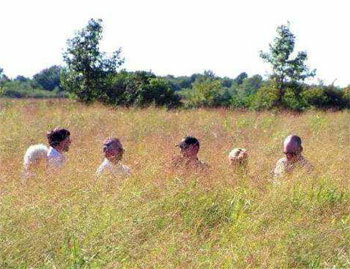 Resource-efficient native perennial grasses like switchgrass are much better suited to this purpose. They have a number of desirable traits including that they: are adapted to marginal lands, require minimal fertility and management, are low cost to produce, have moderate to high yields, and produce 40 % more net energy gain per acre than corn. The use of marginal farmland for bioenergy production also creates less conflict with the global food supply. The second thing that needs to be done is to efficiently convert the captured solar energy (known as biomass) into a useful energy form. Scientists now understand that liquid fuels are the losers in the energy conversion game. It's much more energy efficient to produce biogas and fuel pellets from biomass to replace fossil fuels. In a race to create energy security and limit greenhouse gas emissions, whole plant biomass crops converted into pellets or biogas beat turning seed crops into liquid biofuels hands down. Since 1991, REAP-Canada has pioneered the research and development of biofuel pellets made from switchgrass (Panicum virgatum) for use in space heating applications (Bioheat). 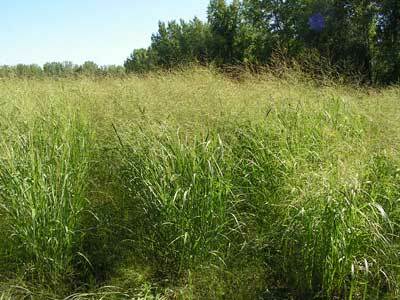 Switchgrass, when pelletized, has considerable potential to displace oil, natural gas, and electricity used for heating fuel. This development can significantly reduce greenhouse gases and heating costs and sustainably assist the development of rural communities. efficient combustion in advanced, affordable, and user-friendly devices. After 18 years of research and development working with farmers, industry and scientists to grow, densify and burn grass pellets, the technical limitations to develop this industry are largely a thing of the past. The industry is now ready to emerge and fine-tuning of the production systems is being undertaken. A number of resources are now available to guide you through the various steps of producing and/or using grass biofuel pellets. REAP-Canada conducts agronomic research and breeding on switchgrass cultivars and other grasses to develop optimum strains suitable for grass pellet production. Adaptability trials are used to assess which varieties are best suited to the various growing conditions found in each region. Farmers need to source the best adapted plant materials for their region from reputable seed suppliers. Fortunately, a growing choice of cultivars and seed suppliers is developing to support the grass pellet industry. A number of production guides are available to grow warm season grasses like switchgrass, including the REAP-Canada production guide. To densify grasses, individual or groups of farmers will need to establish their own pelleting or briquetting factories. 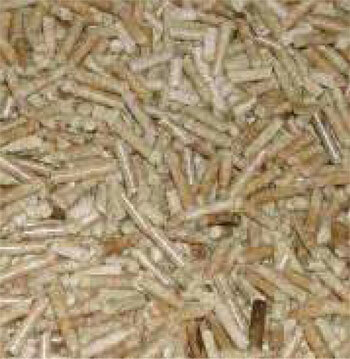 In some localities existing alfalfa or wood pellet plants can be utilized. Pellet plants typically need to be in the size range of 50,000 tonnes or more in order to be efficient and will cost approximately $5 million dollars. The briquetting of grasses is a lower cost option, with basic production systems which can produce approximately 10,000 tonnes per year costing about $600,000. 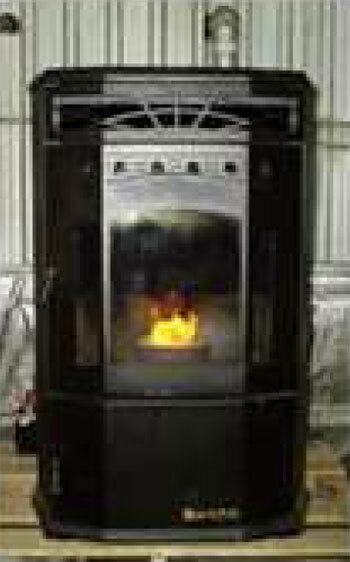 Briquettes, because of their larger size, are mainly used for larger commercial or industrial boilers. The pelleting of grasses is not difficult provided the following conditions are met: the material needs to be fine ground to pass through screens of at least 5/64" or smaller; it needs to be treated with high temperature steam of at least 90 degrees Celsius; and an appropriate sized pellet die needs to be utilized typically with a thickness of 2 1/4" to produce 1/4" pellets. 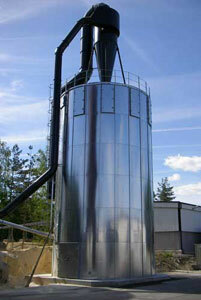 For more information on grass pelleting technology and suppliers see here. There are a growing number of pellet stove and boiler suppliers developing advanced combustion appliances that can burn grass pellets. The most successful experience to date has been burning these fuels in commercial boilers used in the greenhouse industry. Combustion studies by Natural Resources Canada have confirmed that switchgrass pellets can burn cleanly in advanced combustion appliances and are the cleanest burning agro-fuel source with emissions similar to wood pellets. Advanced combustion technology to cleanly and efficiently burn grasses is now being incorporated into stove and boiler technologies. For a list of combustion appliances conducive to use with grass pellets see here. Overwintered switchgrass material ready for baling in the spring. Contrary to the prevailing wisdom that reducing GHG emissions will raise societal energy costs, pelletized or briquetted biofuels can provide consumers with lower and more stable heating costs while dramatically cutting GHG emissions. Given that agricultural commodity prices are declining in real dollars, pellet and briquette fuels are likely to become cheaper over time. By contrast, woodbased pellets have been rising in cost due to growing scarcity as the demand for wood pellets made from forest residues increases. If we are to avoid whole trees being cut down to make wood pellets, new solutions like developing fast growing prairie grasses need to be realized. The development of a grass pellet biofuel industry has great potential to revitalize rural economies by effectively using marginal farmlands and cutting on-farm fuel costs in heating intensive sectors like greenhouses. During combustion of plant-based fuels, the carbon dioxide emitted is considered to be sequestered during the growth cycle of the plant. Carbon emissions are largely neutral except for energy associated with their production and conversion into fuel pellets. The savings in GHG emissions is considerable because pellets (at 8.2 kg CO2e/GJ) have much lower emissions than coal (93.1 kg CO2e/GJ), liquid natural gas (87.9 kg CO2e/GJ), and natural gas (57.6 kg CO2e/GJ), offering net offsets of 86-91%. The 440 million ha (1.1 billion acres) of farmland in North America could be used to create a renewable source of energy if currently viable biofuel production systems were expanded. 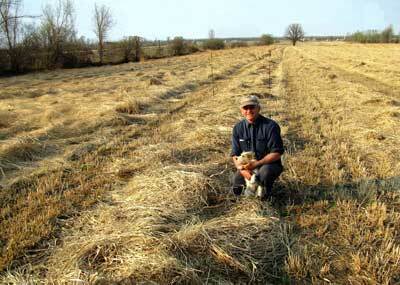 In most agricultural regions, warm season grasses can be grown for $3-5 USD/GJ. 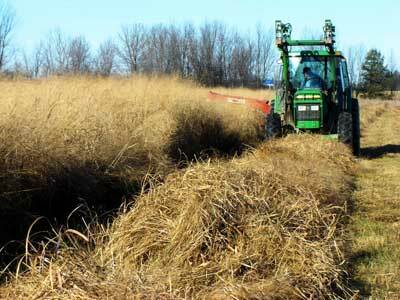 In Quebec and Ontario, farmers working with REAP-Canada have been getting about 8-10 ODT/ha harvested from a typical field of switchgrass, which is equivalent to approximately 24-30 barrels of oil/hectare. As switchgrass is a resource efficient plant that largely runs on solar energy, it produces 20 times more energy than is required to grow it and deliver it to a bioconversion plant. Most efforts have been made to produce power (though co-firing with coal) and cellulosic ethanol from grasses, but these bioconversion technologies appear not to be economically competitive. Converting this feedstock into a viable energy option suitable for widespread application requires an energy efficient, economical, and convenient energy transformation pathway to meet consumer energy needs. Of the farmland in North America (932 and 168 million acres in the US and Canada respectively), we estimate that 150 million acres could be dedicated to energy farming without appreciably affecting North America's food supply. Assuming biomass energy crop yields are 50% higher than the current hay yields, harvested perennial grass yields of 5.9 and 8.1 tonnes/ha in Canada and the US respectively can be expected. A total production capacity of 424 and 55 million tonnes could be achieved in the two respective countries by growing grasses on 130 million acres in the US and 23.4 million acres in Canada. Assuming grass fuel pellets contain 18.5 GJ of energy/tonne, 8.9 billion GJ (an energy equivalent of 1.5 billion barrels of oil) could be produced each year from energy crop production on 14% of North American farmland. With U.S. crude oil imports of approximately 3.4 billion barrels per year, the U.S. could displace the equivalent of 39% of its oil imports by growing biofuels on 14% of its farmland. The most promising regions to develop a grass pellet fuel industry are those where hay production costs are low and heating costs are high due to long winters and high fuel costs. Based on hay prices, land costs, relative winter heat costs, and warm season grass performance data in North America, some of the best opportunities exist in the states of North Dakota, South Dakota, Nebraska, Minnesota, Wisconsin, and the provinces of Manitoba, Ontario, and Quebec. Documents published regarding REAP's bioenergy projects are located in the on-line library.